The leading agri-food company ABP has announced it will be supporting Ulster Farmers’ Union’s centenary drive to raise £100,000 for the Air Ambulance Helicopter Emergency Service through its Summer Steak Barbecue for farmer-suppliers later this month. 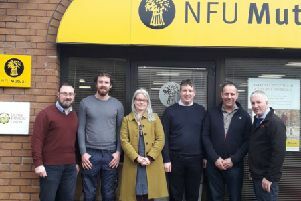 Commenting on the decision to get behind the UFU’s Air Ambulance appeal, UFU President Ivor Ferguson said: “We are very pleased to have ABP’s support in our centenary year. The event is expected to attract hundreds of ABP’s beef and lamb producers and their partners when it takes place at the Armagh City Hotel on 22nd June. With live country music and dancing to Johnny Brady, Downtown Radio’s Drivetime Presenter Neal McClelland will host the event and the charity auction. Two tickets to see Shania Twain at the SSE Arena in September will be awarded to the ‘Most Appropriately Dressed Lady,’ courtesy of Downtown Radio. Speaking ahead of the event, Liam McCarthy of ABP said that 100% of ticket sales to its suppliers would be donated to charitable causes and that he hoped farmers would be there in force to support what promises to be a great night out.